NaClhv: The Gospel according to Disney's "Tangled"
Based on all the things I've written about "Frozen" in this blog, you might guess that "Frozen" is my favorite movie - But it's not. I obviously like it a lot, but my favorite movie is "Tangled". Why do I like "Tangled" so much? Well, some movies are good, and some movies are bad. You can generally find out which is which by reading reviews. But then, there are the movies that are meant just for you. These are the transcendent movies - the ones that I cannot review at all, because I cannot possibly do so fairly. It's as if you've been test driving cars and one starts to fly through the air - was that a good car? How are you even suppose to answer that? I think "Tangled" is a pretty good movie - it received some good reviews and did decently well at the box office, and is sometimes credited with starting a second Disney Renaissance. But I don't care much about all that. The reason I like "Tangled" is not for any of those things. My reason is difficult for me to explain - my experience with the movie may be something unique to me - but I will nevertheless attempt it. My reason comes down to a single moment, one second in one scene in all one hundred minutes of the movie that somehow contains the whole movie in itself: when Eugene cuts Rapunzel's hair. As a reminder, this is the lead-up to that scene: Rapunzel realizes that she's the lost princess, and openly rebels against Mother Gothel. Eugene realizes that Rapunzel's "mother" is a danger to her, and rides to the tower. But upon his arrival, Gothel already has Rapunzel in manacles, and fatally stabs Eugene. As he's dying, Rapunzel declares that she will never cooperate with Gothel unless she's allowed to heal Eugene, and seals her declaration with her unbreakable promise. Gothel consents, but Eugene insists that Rapunzel can't do this - that she can't give up her freedom for his life. Rapunzel counters that she can't let him die. Just as Rapunzel is about to heal him, he momentarily stops her - then cuts off her hair. So it will lose its power. Then she can't heal him. And she will be free. He is aware of all this. Yet he still chose to act. This means that he loves her, sacrificially and therefore truly. Somehow, I subconsciously understood this whole chain of reasoning in the brilliant flash of that single moment, while my conscious mind was caught completely by surprise and left simply reeling. I only remember being slammed by a magnificent sense of epiphany, overwhelmed by an ineffable feeling of significance. I could never recapture that moment fully; that is as it should be. By the time that my brain had caught up to my subconscious realizations (as Gothel was falling out of the tower), I was saying to myself, "This may be my favorite movie of all time" - for if you surprise me with an act of love, then you have my love forever. I don't expect others to have shared in my experience as I've just described it - but for me, no other movie has come anywhere close to delivering the feelings I had in that one moment. The haircut is the ultimate proof of Eugene's love, righteousness, and worthiness. Eugene and Rapunzel begin the story by deceiving, coercing, and manipulating each other. But they slowly grow closer over the course of their journey, until they finally "see" each other during the floating lanterns ceremony. Here, Rapunzel gives Eugene her crown, and because of her inherent innocence and naivety, this is enough to convince us that she really does love him. But Eugene had earlier been characterized as worldly, greedy, and even treacherous, and until the haircut, he doesn't do anything dramatic enough to fully reverse that characterization, or show that he really loves Rapunzel. It's true that Eugene had been caring, but what is that worth in this story? How do we know that Eugene wasn't simply taking care of a pretty girl who's in love with him, in the same sense that Mother Gothel was taking care of a walking fountain of youth? Or perhaps he loves her only for her hair and her powers, like so many others in the story? Though Eugene may appear to love Rapunzel, apart from the haircut - apart from the sacrifice - there would be no ultimate substance. In this one act Eugene demonstrates his love for Rapunzel and his transformed character, and thereby becomes worthy to take Rapunzel as his wife. So, the haircut is fundamentally an act of love. 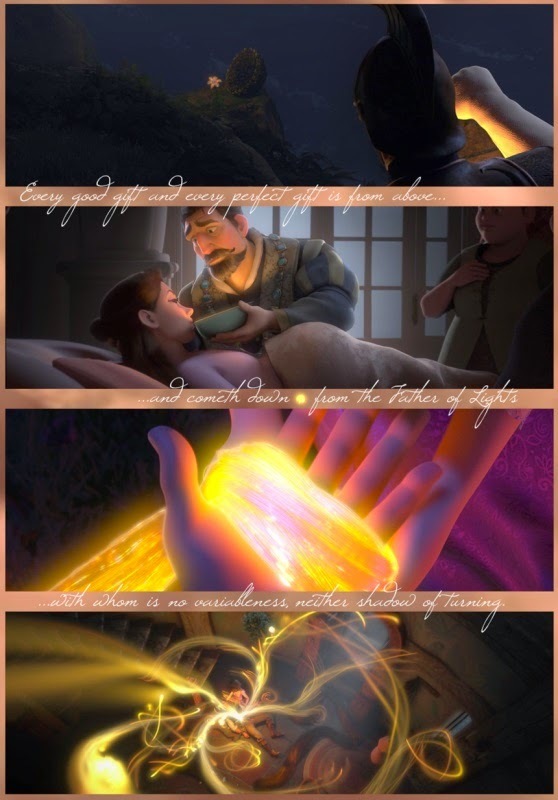 It ties together the whole of "Tangled" as a love story. The haircut is also the price of dreams, the cost to be counted before pursuing them. Consider the sacrifices made; Of course, the haircut costs Eugene his life. He gives up on his castle, his enormous piles of money, and his new dream of being with Rapunzel. But also for Rapunzel, it costs her everything she has. In that one second she loses her hair and her powers, and therefore a large part of her identity. It costs her the only mother she's known, and the man she loves. Weighed against all that cost, the haircut gives Rapunzel only her freedom - the freedom to run after her new, true identity, her royal heritage. Although this identity seems distant in the moment of the haircut, it is in fact the antitype of her dream, the solid reality of which the floating lights were mere shadows. Contained in this meager-seeming gift of freedom is the most important thread in the story, the fulfillment of Rapunzel's dreams. Eugene counts the cost, and decides that his life, along with Rapunzel's old identity, powers, and peace, were all worth sacrificing - all for the sake of her freedom. He therefore does what she could never do for herself, and cuts off her hair. But in this act of sacrifice, he uncovers the very heart of the story - that their dreams are connected to something much larger, something they could have never even dared to hope for. That everything they wished for and more, and even everything they sacrificed, will be given to them. That their dreams, and the dreams beyond these dreams, will become their new identity. So in the haircut is all the sacrifice, and all the restoration, of Rapunzel and Eugene's dreams beyond dreams. For even Eugene's resurrection is foreseeable from the haircut scene: the drop of sunlight falls from the heavens, and there grew a magic flower. The flower is uprooted and plucked, and made into a miraculous medicine. The medicine is consumed, and a princess is born with magic hair. The pattern is the same each time: the old seed perishes, and it bears new fruit. How could Rapunzel's haircut have resulted in anything but the greatest working of the Sun's power? It was all foreshadowed from the beginning, from the very first line. So the haircut points towards the resurrection, and through it, the whole epilogue. Once it is done, there are no other possibilities for the ending; the remaining story is set in stone. Not only does the remaining story lead out from the haircut, the whole story also leads up to it: it's the heart of Rapunzel and Eugene's love story. It defeats the villain as a side effect. It's the moment their dreams meet reality, when their dreams die and come true. It's the only possible resolution to the story. So in a singular, irreversible act that irrevocably achieves Eugene's will, every major theme, foreshadowing, and plot in the story collides and is resolved with the haircut. It is all finished. At this point, I hope it's clear why this post is titled "The Gospel according to Disney's 'Tangled'", and why I have set this movie above "Frozen", despite the latter's clear Gospel parallels: it's because Rapunzel's haircut reminds me of the crucifixion, in some small ways that I've attempted to detail above. There are other Gospel parallels besides the haircut scene: "This is the story of how I died" are words that can begin any Christian testimony. "It starts with the Sun". Rapunzel is the lost princess, unaware of her royal destiny. The lies of this world are like Mother Gothel's lies - 'The lights are just stars. You are not meant for the world outside. Stay in this tower'. Flynn and Rapunzel are baptized in the dark, watery cave, undergoing death and rebirth, transforming Flynn to Eugene. The lights of Rapunzel's dreams were always the light of unfailing love reaching out for her. She has always been royal, a true daughter of the king and queen, of a kingdom that's not confined to her tower. The truth sets Rapunzel free, and allows her to stand up to Gothel. All these parallels are worth noting. But the cross of Jesus Christ is the central mystery of Christianity, and in the haircut scene, "Tangled" illuminates a bit more of that mystery for me. And if you surprise me by revealing God's love in a new way, then you have my love forever. So what happens to the magic now? Is Eugene now carrying the magical power somehow, or was the original drop of sunlight specifically a gift for his ultimate resurrection, and now the two of them live out a mundane life (or, as mundane as a royal couple can be)? Well, this is getting into my personal headcanon, but I like to think that Eugene does carry the magic of the Sun at the end of the movie - perhaps even getting that super-strength in his hand that he wanted. But he would have lost it pretty quickly, by using his powers sacrificially for the sake of others, the way it was always meant to be used. Perhaps it goes next into his and Rapunzel's children (twins, according to the original fairy tale), who in turn use it and pass it on. The healing power of the Sun would thereby go on propagating among all the people, changing the lives that it touches. All that is only a personal pet theory though. I don't think there's a way to tell anything from canonical materials. Magical power does not matter, it's love that saves. Eugene's resurrection happened after the magic was gone. Now the couple have freedom and love, magic is really minor compared to them. Some people say that when Rapunzel and Eugene attended Elsa's coronation they'd be 60+ years old but still look young. Perhaps they did exploited that magic xD. I disagree with this, it's what Gothel hoped. If, as is the prevailing theory, the King and Queen of Arendelle were en route to Eugene and Rapunzel's wedding when their ship went down, then that was just three years before the return trip. It seems likely that Eugene's "years and years of asking" were a sliiiiiight exaggeration, but even if that's true, I would say there's less than a decade between Tangled and Frozen. They wouldn't be 60+ years old. In my opinion, the story between Rapunzel and Gothel is well grounded and developed, that between Rapunzel and Eugene maybe not. The climax, the cut happened like a burst without earlier warning. I like your description of that moment as "epiphany" and agree with your analysis. Just feel the "brilliant flash" is too abrupt. Compare "Tangled" with "Frozen", I like Frozen much better. An aura of a little sadness, a shadowy heavy story, sisterhood that is frozen for 13 years (OMG Hans is the 13th in line), with sunlight only appear in the coronation day, a helpless queen bears a strong "curse" AND a very clear Christ figure. Not to mention the great music and animation. But what difference in the theological level makes "Tangled" your favorite? Just because of the glorious shocking moment that can't be recalled? I like the characters in both "Tangled" and "Frozen", which are largely different. Eugene and Rapunzel are more energetic, Rapunzel looks stronger and sunshine than the Arendelle princesses while Elsa is much more beautiful and regal (being a christian, she was cut off from light and consumed by fear for most of her life until 21. Feel sympathy). My favorite is Anna, a girl of courage, faith, hope and love. The haircut scene feels like the crucifixion to me: that's the main theological reason I like "Tangled". I think if you read this post with that in mind, you'll be able to see the connections. I especially like how Eugene intends for the chain of events in the climax to happen, and how he accomplishes it in an irreversible way. Also, Rapunzel has to really, completely give up her old life as part of this act. All these things reflect an aspect of the cross to me that's uniquely revealed by "Tangled". Overall, I think "Frozen" has a very strong act 1 culminating in "Let It Go", and "Tangled" has a very strong act 3, culminating in the climax. I like the characters in "Frozen" better, but I the haircut really pushes "Tangled" over the top for me - if a work of art surprises me like that with love, it has my loyalty forever.